Being bilingual provides a variety of perks. Aside from giving you the ability to impress your latest love interest by reciting foreign poetry, being bilingual also pays dividends – monetarily, cognitively, and culturally. See the graphic below to find out why. Note to teachers, edubloggers and all those interested: Want to use this infographic in your class or share it on your blog? No problem! You’ll find a cool collection of classroom activities and sharing options below. We think that infographics are an awesome learning and teaching tool, so our creations will always be available for you to print out, use with your students and/or embed on your blog! Before handing out the infographic, discuss the following question with your students: What are the advantages of being bilingual? What is the most surprising fact that you discovered from this infographic? Is the information in this infographic applicable in your own country or society? Give examples. Since beginning your English studies, what perspective have you gained on the advantages of being bilingual? Do you agree with the statement that there are cognitive, monetary and cultural benefits to being bilingual? Why or why not? Today, many people would say that English is the most important language in the world; if English is not your first language, then you should become bilingual in your L1 and English. Do you agree with this statement? Why or why not? If you agree with the statement in #4, do you think that another language will ever become more important than English? After reviewing this infographic with your students, have them write an essay or blog post based on the facts from the infographic as well as their own findings. Encourage them to do their own research using the sources listed at the bottom of the infographic. 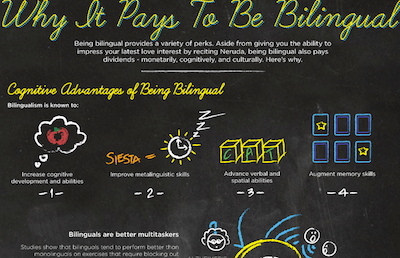 This entry was posted in Archive and tagged bilingual, bilingualism, infographic, language, learning, teaching, voxy, why it pays to be bilingual. Subscription confirmed! Check your email periodically for updates from the Voxy blog.